I posted this once before in a different thread. While maybe not quite yet a classic it is a discontinued and highly regarded telescope. Plus it was a bit of a shocker since I own one. 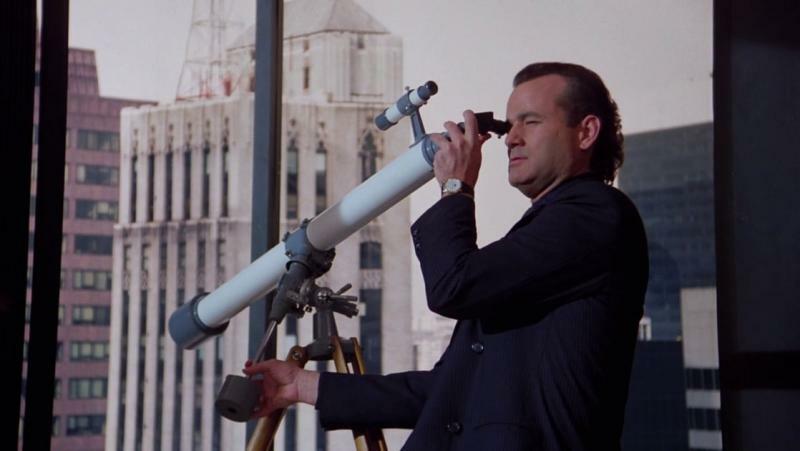 An Orion Eon, or could possibly be a Skywacher Equinox, figures prominently in the movie Skyline from 2010. It is shown numerous times and is used by the characters throughout most of the movie. There is no doubt about it, the black scope with chrome trim rings is a dead giveaway. Check it out if you get the chance. The movie isn't that great but it is syfi and seeing the telescope made it worthwhile. 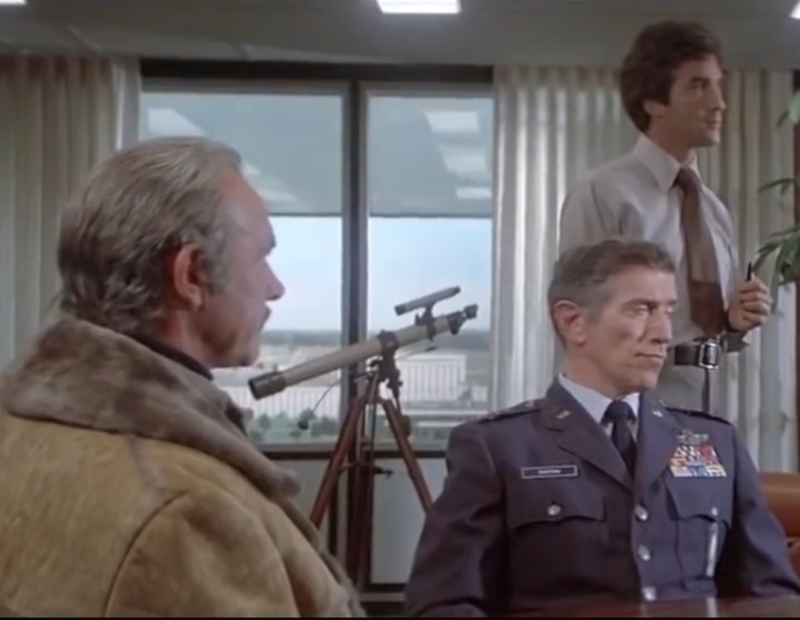 I spotted this vintage refractor while watching the movie "Meteor" with Sean Connery. It's the scene near the beginning where they're meeting in the NASA office. Is it just me or is that a vintage Swift? Which model do you think it is? I was thinking it was the 831. I wonder what happened to it. Maybe, a CN user has it now? After all, not too many of them. Edited by agmoonsolns, 19 January 2019 - 04:45 AM. In the first part of the scene, it's pointed in the wrong direction (downward) and then a little further along, it's pointed out the window. 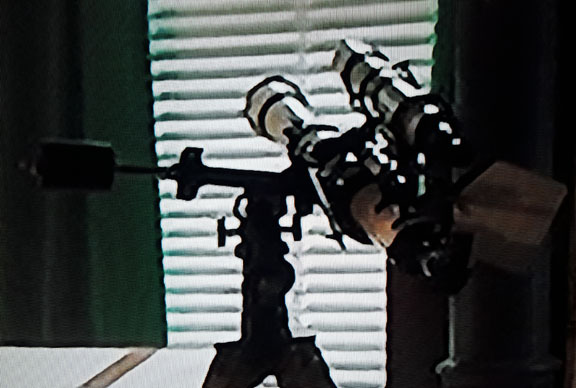 I love it when I can recognize a telescope in a movie. Admittedly, not much science in this science fiction. This one requires the viewer to use a huge dose of suspended disbelief. Edited by agmoonsolns, 19 January 2019 - 04:56 AM. Strongly agree with posts #3 and #4. Doh! I wish I had known about that thread, you're right! Maybe, I can get a moderator to move it over. Egads, I didn't about this thread at the time, sorry. :-( At any rate, trying to do damage control by adding a link to it here. I should have known there would already be a wonderful thread like this one. Surprised nobody has mentioned the scene in La La Land where they go through the museum room at Griffith Park Observatory with all of the classic instruments and telescopes. It's somewhat dark, but the large refractor in the center of the room is clearly visible as a silhouette. 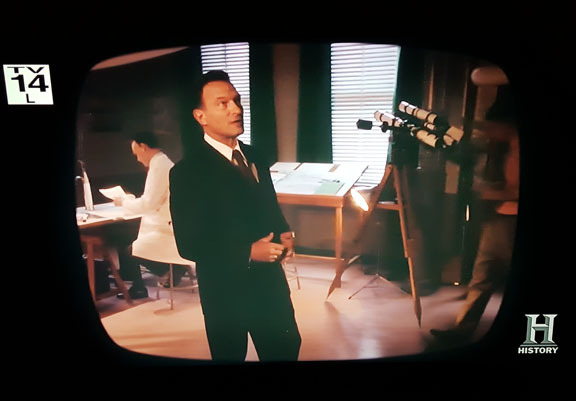 I'm sure most of you find it interesting when telescopes appear in TV shows, the entertaining parade of various scopes through the 12-year run of The Big Bang Theory for example. Also the large percentage of appearances where a Newt is pointed at the ground (as well as in many Craigslist ads). 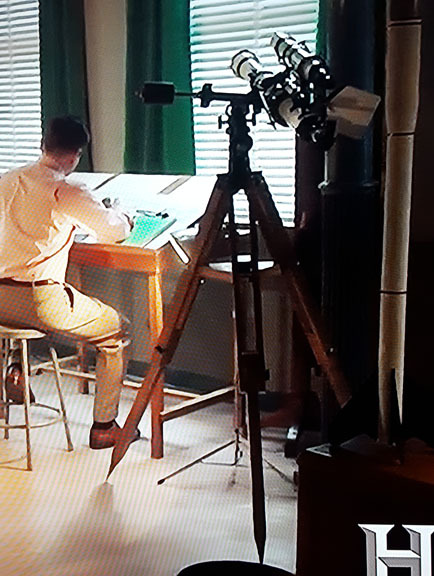 Last night I was watching the fourth episode of The History Channels "Project Bluebook" called "Operation Paperclip" and there is a scene where Wernher von Braun is speaking to the camera in what looks to be a design office and there is what appears to be a very nice Unitron refractor rig in the background. At least it's pointed the right way! Very nice Unitron! Thanks for pointing that out. I have that episode recorded but haven't viewed it yet! Not a telescope, but I have seen episodes of The Big Bang Theory that had a couple of Burnhams Celestial Handbooks sitting on the end table next to Sheldon's spot on the couch. One of my favorite parts of one of my favorite Christmas Movies! Here the long thread on classic telescopes in tv and movies. I started it a number of years ago and has been going strong. The moderators should move these posts into it. They had Hynek and his kid looking through the wrong end of a Newt in the 1st or second episode. 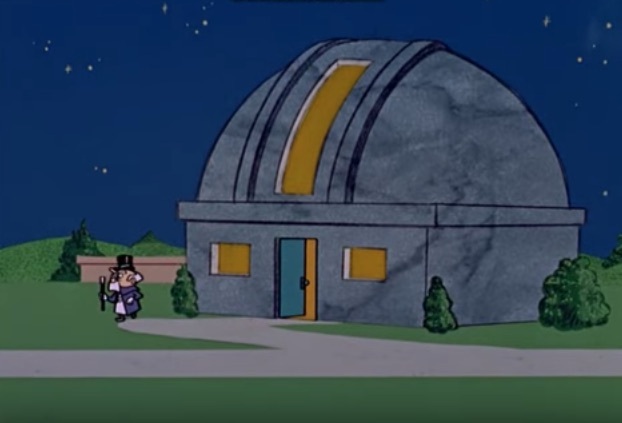 It's not really an old show, but on a re-run of "Modern Family" Jay, Mitchell and Manny have gone out to watch a meteor shower. They have two scopes with them, one is a C8 on a goto mount, the other a refractor which you would all recognize but I can't remember what it was. The funny thing is that if you look closely, neither scope was equipped with an eyepiece, they both had diagonals but no oculars. Meteors don't hang around long enough for telescopic viewing anyway. The Unitron may have been set up by a stage hand who knew nothing about setting up telescopes. The tripod and mount bolts may have been very loose and the telescope unbalanced. The Unitron mounts are considered to be top notch, and I don't think a one time glimpse of a possibly poorly set up Unitron on a kids television show can be any indication of their stability. Edited by Steve Allison, 30 January 2019 - 06:45 PM. Does anyone remember this CBS television show..."The $64,000 Question"? 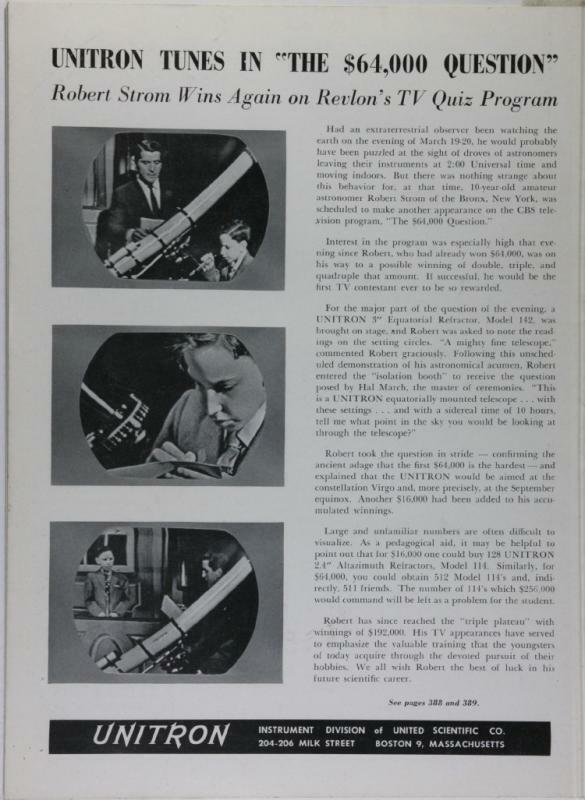 In 1957 Robert Strom...who made it to the $64K question and beyond…was provided a Unitron Model 142 as part of the question!! Not a telescope but the building that usually houses one.